Our Research focused on the composition of the formula and the choice of materials to bring together a maximum of properties with a minimum of ingredients. This exploration took almost a year because of the difficulty of the requirements. We wanted a biodegradable and 100% natural product to clean the body and hair with superior qualities than everything available. The texture had to be foaming and silky, leaving the skin feeling moisturized, and easy to rince. The powder needed to be concentrated, so that small quantities could be used. Last but not least, it needed to be well tolerated and good for the whole family. Nomas* was born from this process, the constant resolve of Laboratoires de Biarritz to progress in its Research, to explore new active ingredients, new products but also new methods of sustainability. Out with the numerous bottles and containers in our bathrooms, out with the plastic that they all require. Because shampoo is often 75% water, wrapped up and shipped over great distances... People use a lot, and their production generates large amounts of waste. "I'm a fan of Nomas, everyone in our family uses it, kids and teenagers with long hair too"
The foaming gel is now ready to be used. 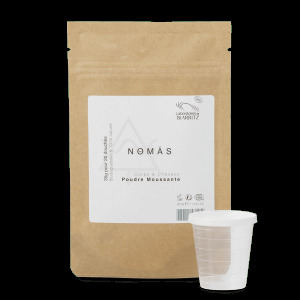 100% Natural and 100% vegetable formula, Nomas is a mix it yourself powder. Nomas from Laboratoires de Biarritz, is formulated with only 5 ingredients to offer a cleansing foam for the body and hair. 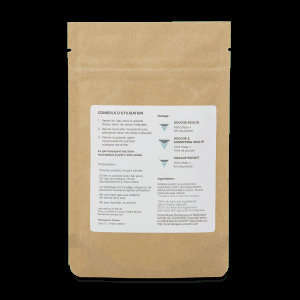 Its active ingredients are organic oatmeal powder, with moisturizing and soothing properties, and a two-in-one hair conditionner and skin softener. Its silky foam is easy to rince.